The Masters 2018 looks set to be one of the most intriguing majors in a long time with pretty much all the world elite in good form. From a betting perspective, value is thin but in my google document below you'll find an estimation of my updated and projected fair odds (win odds to 100%) of the top 25 v the Masters field that you can use as some sort of a guide. Lots of books are offering extra places so the bookie odds are an average. 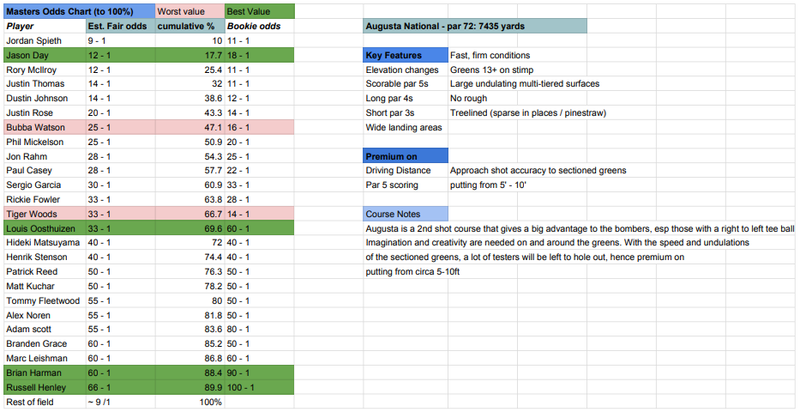 There's also some course notes targeting premium attributes and highlighting key metrics and biases. Below this I've added some stats and trends and ran some numbers. A quick mention too for the Playon and Draftkings fantasy golf Masters contests. Playon are running a $5000 gtd 250 man Masters contest. Draftkings have their $20.00, entry millionaire maker contest (1mil for 1st) and if you haven't got into daily fantasy golf yet, it's a decent time to have a look. (aff links). 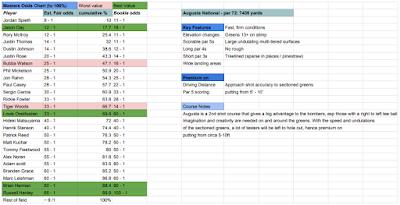 >> odds chart, rankings and course features / premiums. I make Jordan Spieth the narrow favourite following his return to form last week in Houston on a track requiring a similar skill set. There's been a lot of what I perceive to be rubbish talk about Jordan's putting but now we hit the bentgrass season, and Spieth notably actually led the strokes gained approach and strokes gained tee to green stats at the Golf Club Of Houston to finish 3rd on Sunday. His Masters record (T2 - 1 - T2 - 11) speaks for itself. There were a few different putting metrics I played around with but it's interesting to note Jason Day topping "putting from inside 10' this season. For me this is a huge variable at Augusta. It's Phil Mickelson who leads the rankings in putting from 5-15' this season. Brendan Steele is an interesting one and he actually featured a lot higher in different sims I ran so I may take a closer look at him. I mentioned I have Harman and Grace onside antepost from a good while back. Cameron Smith is someone I'm looking at esp in sub markets but below are my three best 2018 Masters bets. 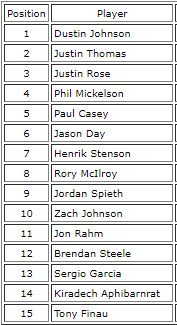 Jason Day ew ranging from 14 to 18 depending on places. He's 2/1 for a top 10 with Unibet. Augusta Form: 2 - WD - 3 - 20 - 28 - 10 - 22. Already a winner at major venue Torrey Pines this season, for the 2nd time. As mentioned one of the best short range putters on tour topping the putting from inside 10' metric in 2018. Day is 10th in driving distance, murders par 5s and has everything needed for Augusta including a top short game, the power draw and a very high ball flight from approaches. Louis Oosthuizen 55/1 - 70/1. 3 figs on exchange.... is the one flying under the radar this week for me. Augusta form: 2 - MC - 24 - 19 - 15 - 41. Form figures look modest but he'd own a green jacket if not for some Bubba magic. Louis is a major winner and is now in good health. He played 5 weeks in a row before resting up last week so should be in peak mental and physical form ahead of Augusta. He is very much simmering and his best form isn't far away with 3 top 30s in his last 4 strokeplay events and a group win in the matchplay. It's 5/1 for Louis to top 10. Russell Henley 100/1+ ew /FRL and what I think is a great value 4/1 / 9/2 top 20 bet. Georgia boy Henley closed with a -7 at Houston last week where he owns a record relative to par nearly double his closest challenger, Phil in 2nd. The secret the flat stick and on similar greens at Augusta, his #progressive 31 - 21 - 11 form there is probably no coincidence. What I noticed about Henley though while watching him in Houston last week was something I didn't know previously: a towering trajectory from approaches. He was launching the ball into the air with the irons and this will stand him in great stead for the multi-tiered greens at Augusta. A potential real live outsider IMO.